Penske Gets First Freightliner Electric Truck | Sonny Merryman Inc.
Daimler Trucks North America (DTNA) on Thursday, December 20, delivered the first vehicle in its Freightliner Electric Innovation Fleet – a Freightliner eM2 – to Penske Truck Leasing, fulfilling the truck maker’s commitment to put an electric commercial truck in customer hands in 2018. DTNA President and CEO Roger Nielsen handed over the eM2 key to Penske Truck Leasing President and CEO Brian Hard during an event in Carson, Calif. The two companies collaborated over nine months in the effort to bring this technology to market. The introduction of the eM2 into Penske’s fleet is also a first in DTNA’s co-creation approach with customers as it co-develops technology to shape the future of transportation. As the first step in its infrastructure deployment, Penske Truck Leasing will install 20 high-power charging stations across five of its California locations beginning this month. Next year, Penske will put an additional nine medium-duty electric eM2 trucks and 10 heavy-duty eCascadia electric trucks into targeted service in California and the Pacific Northwest. 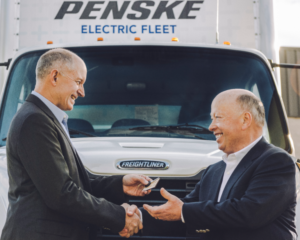 Penske will place the electric vehicles into service within its expansive logistics, truck leasing and truck rental fleets. Also participating in the ceremony was Judy Mitchell, a governing board member at the South Coast Air Quality Management District (SCAQMD), which focuses on improving air quality in the South Coast Basin. The Freightliner Electric Innovation Fleet is partially funded with a nearly $16 million grant from SCAQMD. The U.S. Environmental Protection Agency and the ports of Los Angeles and Long Beach also contributed to the grant. The Freightliner eM2 truck is an electrified solution for local distribution, pickup and delivery, food and beverage delivery, and last-mile logistics applications. The Freightliner eCascadia is a Class 8 tractor designed for local and regional distribution and drayage. Both trucks enter series production in 2021. The Freightliner eCascadia and eM2 are part of Daimler Trucks’ global electrified truck initiative, joining the company’s Thomas Built Buses all-electric Saf-T-Liner eC2 school bus, the FUSO eCanter, and the Mercedes-Benz eActros. Story originally published on CCJDigital.com.